We often get questions from our readers on what is the best face wash for men. Our previous post dealt with the best colognes for men. However, in addition to smelling good, you need to also project a radiant appearance with a well groomed face. When it comes to face wash for men, you will find a wide range of facial products. But each does not respond the same to different skin types. And experts advise people against purchasing grooming products without understanding their skin tone, texture, and overall reactions to the various ingredients used in making the product. Nevertheless, you do not need to worry because we will take you through the best face wash for men; and how frequent you should use them. If you have acne, we got you covered as well. So without further delay, let’s dive in and explore. What Is The Best Face Wash For Men? Gel-based products are ideal for oily and combination skin types. They remove excess oil and decongest clogged pores. Also, these cleansers also kill bacteria that cause acne. Note that a combination skin type is one that has dry and oily parts. For instance, your cheeks can have dry skin while the forehead has an oily one. You can learn more about combination skin types here. Cream facial cleansers on the other hand have moisturizing contents suitable for dry and sensitive skin. Usually, they are characterized by a thick creamy substance usually in the form of milk or lotion. Whereas form-based cleansers have similar traits with gel-enhanced face wash products. However, the former produces a foamy lather upon application, and it is lightweight. These face wash products are suitable for oily and combination skin types as well. Oil cleansers work on many skin types including the oily ones. These face-wash remove stubborn substances that clog pores for men. They also help women remove waterproof makeup without leaving debris. While clay cleansers purify you skin through absorption. They eliminate excess oil and toxins harmful to your skin. However, these face washers are not recommended for dry skins because they have a high hydrating power. There facial cleansers are suitable for dry and sensitive skin. They have distinct traits that allow you to remove dirt, oil, and makeup. Additionally, the product originated in France and features tiny oil molecules in water. You can lean more about micellar water here. Powdered face wash on the other hand serves oily and sensitive skins better on a daily basis. Moreover, you can combine them with water to form a creamy substance that is easy and smooth enough to apply on your face. Notably, powdered cleansers remove dead skin and dirt. These ones comes in solid form. As a matter of act, the modern products are rich in nutrients and have moisturizing ingredients. Also, they have the right PH level suitable for oily and combination skin types. Other face wash products and accessories include cloths, mitts, and sponges that come in highly protected packages. In addition, they have naturally-enhanced fibers (usually plant related) that purify your skin, and remove dead skin cells. There is no right or wrong way to cleanse your face, but you can gain relevant advice from this article. In particular, experts recommend a daily face wash routine for all skin types. However, some skin types respond better with a morning and night cleanse (twice a day). Furthermore, the first step is to wipe your face with a soft cloth or wet wipes. Next select a suitable face wash product and apply a small amount to your hands. Then apply it gently on your face, neck, along the hairline, and below the ears for 20-30 seconds. Last, use warm water to rinse your skin and dry it with a clean towel. Please avoid rubbing the towel on your face and instead pat it over the surface. So let’s jump in here and answer this burning question. Right below are some of the best face wash for men products to consider on your next shopping trip. The NIVEA product removes excess oil and dirt leaving your skin smooth and radiant. Also, it protects your skin from drying as well. Furthermore, this face wash is gel-based with Vitamin E and a refreshing menthol ingredient. Notably, it is a deep cleansing formula that leaves you with a smooth complexion and a healthy appearance. Ultimately, you can use it before and after shaving for a relaxed and comfortable feeling. It has moisturizing contents that do not leave your skin dry after washing. The manufacturer has enriched it with Vitamin E.
It has chamomile elements suitable for lightening and healing skin conditions. Has hazel extracts known for reducing irritation, skin damage, and fighting acne. Also, it has Aloe Vera commonly known for its healing and soothing properties. This face wash is not suitable for some sensitive skins. The Brickell face wash product has coconut, aloe vera, and geranium for protecting and keeping your skin healthy. In addition, any man despite their age can use Brickell Clarifying Cleanser. It is suitable for normal or oily skin as well. Moreover, you can use it twice a day and after a workout session. Its natural ingredients create a moisturizing effect and provide antioxidants beneficial to your skin. Coconut-based cleanser that keep your skin hydrated. Also, it removes dead cells and excess oil from your face. The Aloe Vera elements found in Brickell face wash rejuvenates and neutralizes toxins within your skin. In addition, the product’s geranium component has significant antiseptic properties. It has various moisturizing and nourishing components like Vegetable Glycerine. The manufacturer included organic oil extracts like Peppermint Leaf Oil for a fresh feeling. Depending on your budget, it maybe expensive. This face wash is suitable for people who prefer charcoal-based cleansers. All skin types can benefit from L’Oreal Men Expert face wash product as it solves daily facial problems at a go. For example, it unclogs pores, removes excess oil, and purifies your skin. Ideally, it leaves you fresh with a new sensation. Particularly, you can apply it twice a day and remember to massage it on a wet face with concentration on your forehead. Contains charcoal which has powerful absorption properties for removing dirt and other impurities. It has moisturizing and hydrating elements like glycerin and aqua. The manufacturers have added fragrance to leave you smelling fresh. L’Oreal face wash has skin rejuvenating component known as Moringa Pterygosperma Seed Extract. The Iron Oxides included in the formula protects your skin from UV light damage which causes dullness. May leave your skin dry depending on your skin type. The Rugged & Dapper Face Wash for Men has deep cleansing properties that do not alter a skin’s natural moisture. Furthermore, it provides you with an attractive tone after removing dirt and excess grime. In addition, this face wash has anti-aging elements and plant-based components that remove dead skin cells. It is suitable for daily use especially since it revives your skin and gives it a rich texture. The face wash has organic and herbal ingredients for keeping your skin healthy. It has coconut extracts suitable for moisturizing. Floral-based elements added to the formula (like Hibiscus Petals and Lavender Water) leave your face with a fresh scent. The cleanser also has Jojoba Oil extracts beneficial for soothing dry skin. Price-wise, it’s a little bit on the high side. May not suitable for sensitive skin or people with acne. This product is suitable for all skin types as it removes bacteria and oil. Also, it is gentle and has a soothing texture that is friendly to sensitive skin. Furthermore, the face wash comes with refreshing elements, moisturizing extracts, and vitamins. In addition, it hydrates your skin as well. It has charcoal that absorbs even the stubborn substances. Aloe Vera property found in the cleanser supply anti-oxidants to your skin and moisturizes it. The face wash has olive oil which beneficial in replacing removed oils with healthy ones. Maybe too watery to pour the right amount on your hand. Next, Organic Men’s Face & Body Wash comes highly recommended for its ability to fight acne and soothe sensitive skin. Notably, it is not chemically enhanced or manufactured with drying additives. However, the cleanser’s natural ingredients leave your skin nourished, hydrated, and revitalized. Each wash provides anti-aging agents that may reduce wrinkles and a healthy complexion. Ideally, the cleanser comes with a wide range of healing benefits and skin protection. The face wash has sunflower oil extracts responsible for fighting acne and preventing premature aging. Its avocado elements may repair damaged skin. The product has a rich combination of nourishing and hydrating components. It also comes with Shea butter elements that soften the skin and reduce inflammation. Shea butter has healing properties as well. Rosehip Seed Oil components found in the face wash eliminates dark spots. Depending on your skin type, it may not leave you with an oily feeling. The Jack Black Pure Clean Daily Facial Cleanser is a daily facial cleanser with oat and coconut-based elements. Additionally, it also has antioxidants properties and healthy tone. Equally, the face wash has deep cleansing abilities that remove dirt and excess oil. As a matter of fact, the manufacturers added healing and hydration properties for healthy skin. Also, the product is sulfate-free and with high dermatology recommendations. Its key ingredients like Aloe Vera provide healing and skin rejuvenation. Jack Black is rich in chamomile which provides anti-inflammatory properties and reduces skin irritation. It has extracts from an organic sage leaf that provides antioxidants and Vitamin A. Its moisturizing contents may leave your skin clean and fresh. Lack of sulfate elements in the face wash allows your skin to remain hydrated after use. Not recommended for overly dry skin. Reacts with some sensitive skin types and may not suitable for people with acne. This face wash comes with deep cleansing properties and an enchanting scent. Most of its ingredients are natural extracts from sugarcane, Aloe Vera, rice, and coconut. In addition, Ursa facial cleanser is sulfate free with 99% organic components. Likewise, it is also a daily face wash with essential oils like cedar, vetiver, lime, black spruce, etc. The product’s lack of sulfates leaves your skin less dry. Its AHA complex exfoliates dead skin. Also, it is not irritating to acne skin due to a combination of natural and organic extracts. It has a distinct additive extracted from sugarcane, and it brightens your skin. The rice seed components found in the cleanser moisturizes and soothes your face. It has elements rich in anti-oxidants like white tea. The presence of black spruce extracts enhances the formula with powerful healing and protection characteristics. Does not foam compared to other gel-based products. Has a strong fragrance that may irritate some users. Thrive Natural Face Wash product comes with unique premium natural ingredients that comfort, restore, and eliminate skin irritation. Additionally, it is a healthy dose for men’s skincare with a gel-based formula containing anti-oxidants, anti-fungal, anti-bacterial, and anti-inflammatory properties. Also, the cleanser has a long-lasting effect due to natural extracts and lack of irritating elements like strong fragrances and synthetic materials. It has Juanilama herb known for reducing skin irritation and treat acne. Its healing properties remove burns and blemishes as well. The Fierrillo Vine ingredient found in this face wash may provide for a healthier skin. This facial cleanser favors sensitive skin because it lacks harsh ingredients. The solution is not thick enough which may lead to spillage if not careful. It does not have a great scent due to the high concentration of natural extracts. Manufactured by Lather & Wood Shaving Company, this facial scrub & swas exfoliates, hydrates, cleanses, and smoothens your skin. Notably, it does not contain harsh chemicals but a series of healthy natural ingredients extracted from seeds and plants. Additionally, it is suitable for normal, oily, and dry skins. And for proper results, use the face wash daily or twice a week. The cleanser is an exclusive premium product for men because it has a masculine scent; however, it also be used by women. The face wash does not have alcohol, synthetic elements, or chemical fillers. Its natural ingredients provide a deep cleanse that eliminates dirt and oil. It has exfoliating scrubbing beads that remove dead skin cells. Does not prepare your skin properly for shaving. It is too expensive for using twice a day. Its scent may come across as cheap. In conclusion, all the products we reviewed are great and the best among the competition. Overall, based on our experience the best face wash for men is RUGGED & DAPPER Face Wash for Men. And this is because it’s infused with organic and herbal ingredients that not only keeps your face healthy but also moisturizes, soothes and tones your face while leaving a fresh scent. 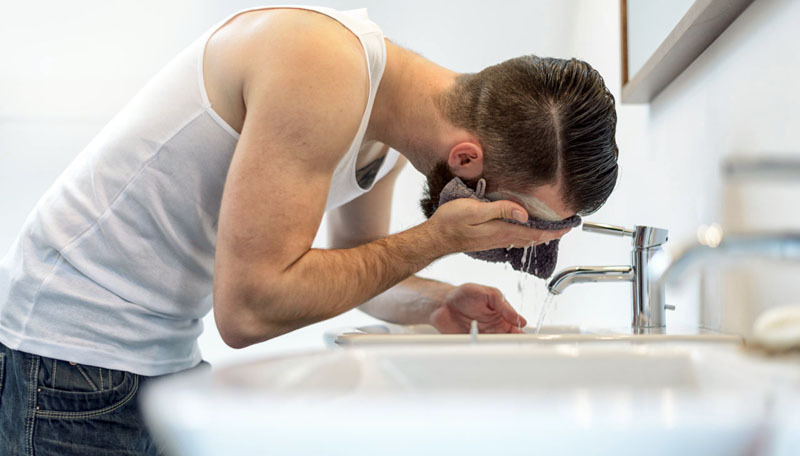 Notably, most users of RUGGED & DAPPER Face Wash for Men have attested to the quality of the product and the inherent benefits it provides going by their online reviews. However, any of the above reviewed products should be considered for your facial cleaning needs depending on your unique skin type and needs. So what are your thoughts? Have you had any experience (positive or negative) with any of the products reviewed? Do you have any suggestion(s) for the best face wash for men? Let us as well as the reader know by leaving your comment below.